Todd Flettrich and Otto. Photo by Susan J. Stickle. 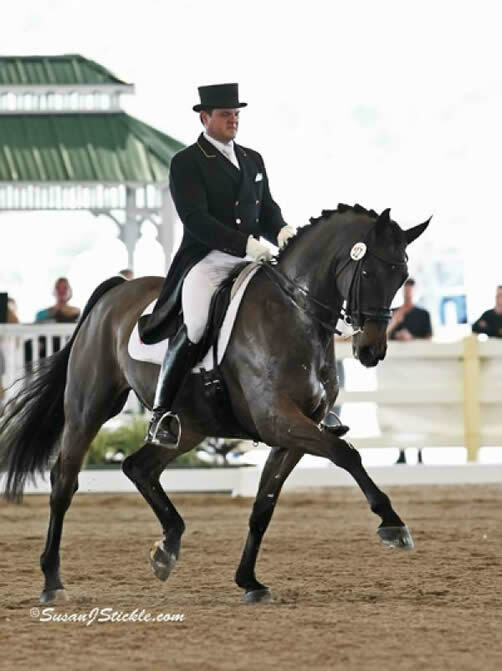 Wellington, FL – June 14, 2010 – Dressage rider Todd Flettrich will depart for Europe the week of June 14, 2010, to compete in international competition with his Grand Prix mount Otto, a 13-year-old Danish Warmblood gelding (Rambo X Rampal), owned by Cherry Knoll Farm. Flettrich plans to begin his trip competing in Fritzen, Austria, and will then head to the Falsterbo Horse Show CDI 5* in Sweden on July 8-11, 2010. 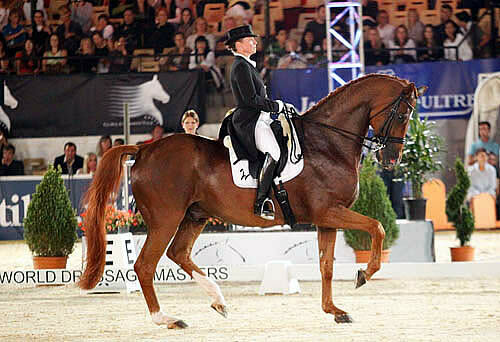 Flettrich will then show at The World Equestrian Festival at CHIO Aachen on July 9-18, 2010. CHIO Aachen is the “Official International Equestrian Tournament of the Federal Republic of Germany” and the #1 ranked horse show in the world. It is a huge honor for Flettrich and Otto to be invited to compete amongst many of the world’s greatest horses and riders at this illustrious event. Flettrich will use the opportunity to gain exposure on the world stage and experience championship competition on the international level as he prepares for the 2010 Alltech FEI World Equestrian Games (WEG). CANNES, France, June 12 – Isabell Werth rode Warum Nicht FRH to victory in the Exquis World Dressage Masters Grand Prix Freestyle Saturday night, the event providing the first victory for the German pair in more than a year and since returning to competition after a six-month break to give birth to a son. Isabell, competing in her third straight €100,000 (US$121,000) WDM CDI5*, scored 77.950 per cent with Belgium’s Stefan van Ingelgem and Withney van’t Genthof in second place on 70.90 per cent and Poland’s Michael Rapcewicz on Randon third on 69.20 per cent. 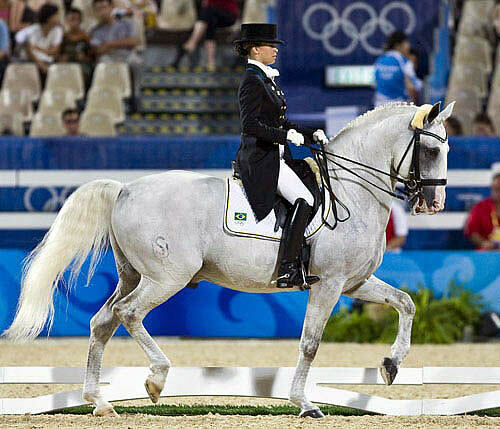 She was smiling happily at the end of the ride on the 14-year-old Hanoverian gelding on whom she won the World Cup Final in 2007, although she did not get to give her final salute until about midnight as the €60,000 (US$72,700) freestyle did not start until completion of the Global Champions Tour jumping Grand Prix in this French Riviera resort. Wellington, FL (June 11, 2010) – Al Guden’s 11-year-old Grand Prix KWPN gelding, Sagacious HF, recently earned Crown Predicate honors from the KWPN (Dutch) Registry. This special symbol on his registration papers means he is ranked in the top 200 FEI Dressage Horses in the world. Sagacious HF was actually ranked 56th in the world. Guden’s journey with Sagacious HF started when Al purchased the 4-month-old colt in Holland in 1999. Sagacious was imported to the US in 2004. Guden put the young gelding in training with Lauren Sammis and that combination turned out to be a very successful match. In 2007, Sagacious and Sammis proved they had what it takes to be international contenders by winning the Team Gold and Individual Silver Medals at the Pan American Games in Rio. Over the next three years they made a very successful transition from the small tour to winning CDI Grand Prix classes at the nation’s most competitive shows. Al Guden, Lauren Sammis and Sagacious became on popular trio on the dressage circuit. Ruth Poulsen’s June Newsletter – Horses and Music and Other Great Stuff! Hi everyone! I hope that the warm weather and the beginning of summer has inspired you to start implementing your new goals for you and your horse. The beginning of a new season is a great time to set some goals and start attaining them one step at a time. I find that writing my goals down as if I have already achieved them helps me stay focused and positive about my day to day progress. It’s easy to over look how much progress you have made in any area when you get drawn in to the day to day routine. Be fair to yourself when you are looking at where you were 6 months ago and where you are now. Sometimes when we have a bad ride or a bad day, our first conclusion is that we are “stuck in a rut”. But if you look back to the challenges you were having 6 months ago, you will find that there have been positive changes! Remember that training is relative! What used to be good enough 6 months ago is maybe not good enough now. So for example, if you worked 6 months ago on putting your horse in front of the driving aids, and you realize that you have to have that lesson again, it may not be because your horse slipped back in his training, it could be that you are in a new place in training and that your expectations are higher than they were 6 months ago. 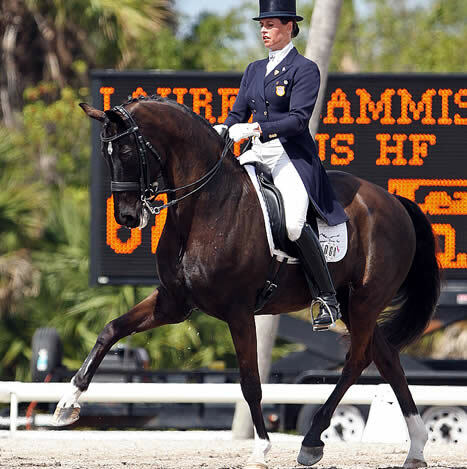 CANNES, France, June 10 – Isabell Werth on Warum Nicht led a German sweep of the top three places in the Exquis World Dressage Masters Grand Prix presented by Massa Stud Thursday, but was disappointed the horse was distracted by flowers blowing in the wind. 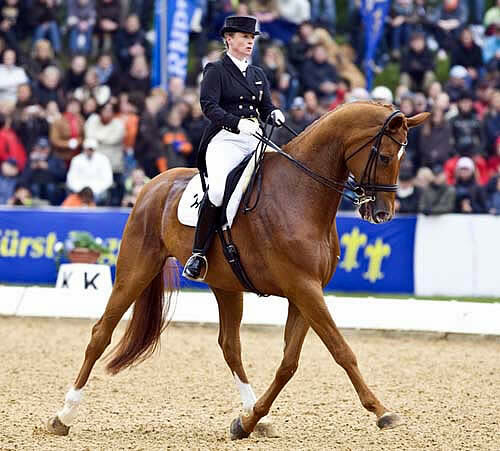 Riding in her third WDM this year – she came third in Palm Beach in February and at Munich last month – and her first ever competition in Cannes, Isabell and her 2007 World Cup champion mount scored 71.489 per cent, a fraction ahead of Anja Plönzke on Le Mont d’Or with 71.447 per cent and Matthias Alexander Rath on Triviant UNICEF with 70.851 per cent. This French Riviera resort was the launching pad in 2008 for the world’s richest lineup of dressage competitions that has grown to five premier CDI5* competitions this year, each one with prize money of €100,000 (US$120,000). Falsterbo, Sweden has been added to the calendar this year and followed by the 2010 finale at Hickstead, England. June 4, 2010 – Lexington, Ky. – Lynn Palm will be a featured performer at the 2010 Alltech FEI World Equestrian Games, September 25 to October 10 at the Kentucky Horse Park in Lexington, Ky.
Activities provided daily by Lynn Palm include Bridleless Musical Exhibitions with elements of dressage, reining and jumping to showcase the beauty, amazing athleticism and outstanding ability of Rugged Painted Lark, her registered American Paint Horse. In addition, Palm will be a presenter at the Clinicians Corral and the Kids Zone demonstrating dressage principles for all breeds, levels and disciplines. Palm’s demonstrations will be available with a Grounds Pass Ticket, which are now on sale at www.alltechfeigames.com/tickets. One of the few clinicians available today with a proven competition record, Lynn Palm’s list of accomplishments include being named 2007 AQHA Horsewoman of the Year and AQHA Female Equestrian of the Year, amassing a record four AQHA Superhorse wins and over 34 World and Reserve World Championships. Palm has also written three books and produced over 50 videotapes on training the Western and English rider and horse. Thousand Oaks, CA – June 2, 2010 – This year is the most exciting calendar year for the United States Para-Equestrian Team in history. It will be the first time ever that the Para-Dressage team will compete with all of the equestrian disciplines at the 2010 Alltech FEI World Equestrian Games (WEG) in Lexington, KY. The hopeful WEG riders first stop this summer was May 28-30, 2010, in Ashburn, Ontario, Canada. 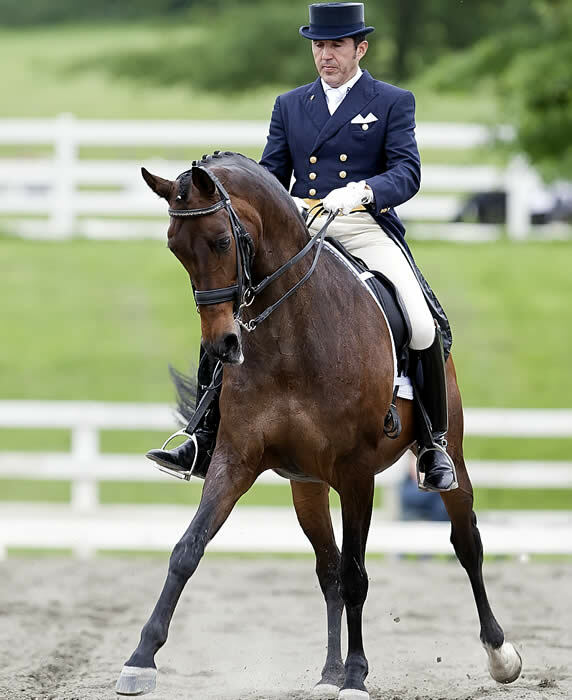 While in Canada riders earned top scores for their performances including the Silver Medal for the United States. Riders used this show as their last big qualifier for the 2010 World Equestrian Games Selection Trials scheduled for June 24-27, 2010 held at the Lamplight Equestrian Center in Wayne, Illinois. 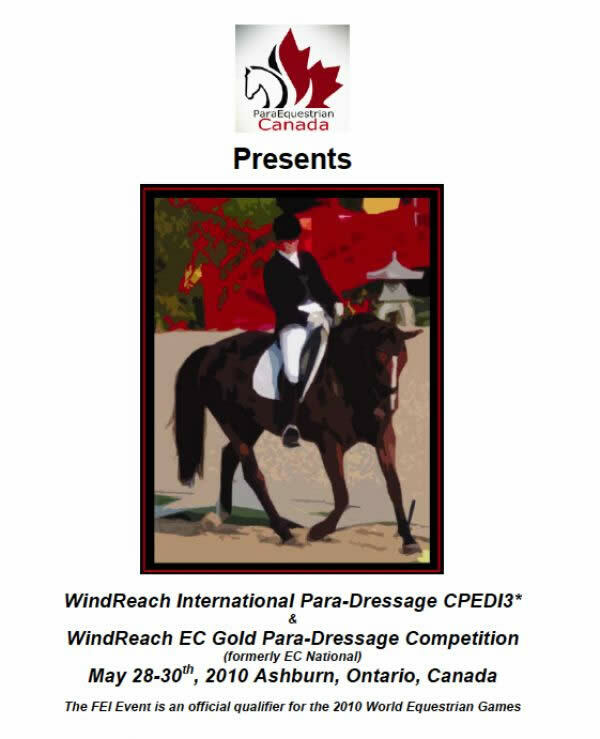 The Para-Equestrian’s journey to Ashburn, Ontario, Canada was to compete at the WindReach International Para-Dressage CPEDI3* and WindReach EC Gold Para-Dressage Competition. This FEI event was an official qualifier for WEG. 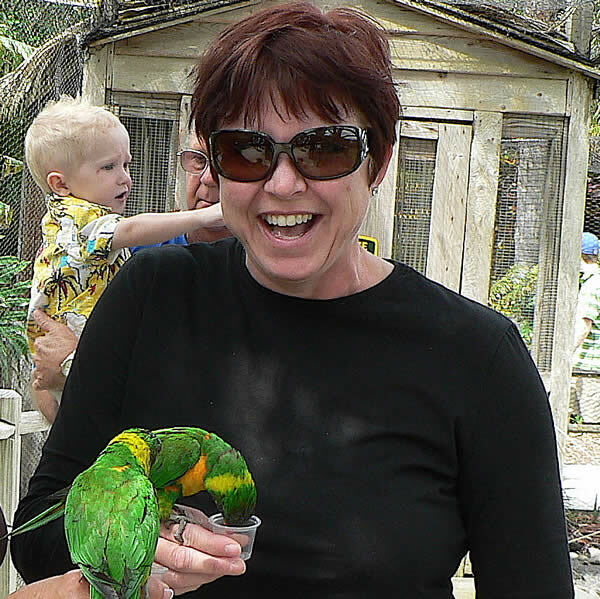 "Traveling from coast to coast is for the birds," says Tami Hoag, taking a little time out to enjoy a few parrots in her new year round residence in tropical Florida. Wellington, FL (June 2, 2010) – New York Times bestselling mystery writer and Grand Prix dressage rider Tami Hoag has traveled from coast to coast each year to live the winters in Florida and the summers in California. This year marks a big change for Hoag as she has decided to stay in Wellington year round. Hoag will continue to create her thrilling and heart-stopping murder mystery New York Times Bestsellers while she trains and competes in Florida. “The stress of traveling back and forth is a lot for the horses and this is a great opportunity to settle in and make Wellington home. The best resources are available in the area including boarding, training and showing,” said Hoag. Hoag released her latest mystery novel Deeper Than the Dead this year and it quickly became Hoag’s fifteenth New York Times bestseller. Hoag is in full swing with the sequel to Deeper Than the Dead called Secrets to the Grave. “It is already scheduled to go on sale in December of 2010, so no time to dilly-dally. My day consists of riding in the morning, the gym in the afternoon, and working in the evenings,” Hoag said.